Just the other day my husband and I were out running errands when he saw a side of me that he isn’t used to seeing. For the most part in our relationship I am more passive and let him handle all of the “tough” situations. Well, on this day we were picking up something that I needed, that was very important and we had been informed that it was ready for pick-up, yet it was not. At this point, I didn’t get upset, I calmly asked to speak to the manager of the establishment so that we could get it sorted out (which we did with very little problem). Once we were back in the car my hubby was chuckling a bit…admitting that he liked that I had been “bossy” to get what I needed. 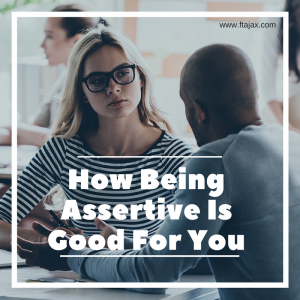 This conversation prompted a discussion about being assertive rather than bossy or aggressive. Being assertive is a core communication skill, which requires you to effectively state what you need or want in a situation, without disrespecting others. Being assertive can help you reduce stress, boost your self-esteem, and earn other’s respect. I like this table shown below, as it lays out the differences between the three communication styles: passive, assertive and aggressive. If you struggle to be assertive within your relationship or with others, check out these five tips to become more assertive. Use a calm and even tone and make eye contact. It is important to speak to someone in the way that you wish to be spoken to. Therefore, lower your tone and use clear and appropriate language. Eye contact is a powerful tool and should be used when communicating to show confidence and respect of self and others. Remain relaxed and use open body language. Use “I statements.” When you use “I statements” like “I need to change our plans” your needs and/or wants are conveyed directly. Also, this eliminates the other person’s need to defend themselves as you are just expressing point. Describe your feelings. As much as possible and appropriate express clearly what you are feeling due to the current situation. This helps to show the importance of what you are expressing and how it is affecting your life now. Stick to your guns. You may have to repeat what you need or want. This is normal. Let the other person know that you hear them and understand where they are, then restate your point. Learn to say no. Know your limits. Know that it is more than okay to say no in order to protect yourself from being taken advantage of. Also, know when to walk away from a situation or ask to speak to a manager in a customer service setting. Again, using the same tips, express your point. So you see, I was just being assertive to express my needs, not “bossy” at all! If you find that you have difficulty with communication styles, contact us so we can help you express your wants and needs in a healthier way through individual therapy or couples therapy.